What are Nanodots? They're tiny. And round. They're silver or gold or black or just metal-colored. They're magnetic  ridiculously magnetic, so that it takes a tenacious tug to get them apart. They also stick to you: not literally, but once you pick them up it's very hard to put them down. 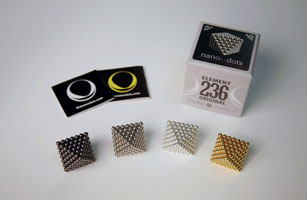 Nanodots come in packs of 216, which you can (and will) squish and massage into a surprising number of geometric shapes. They also like to stick end to end to form strings and ropes. They're perfect for kids curious about magnetism and geometry  not very young ones, please; you definitely don't want a toddler swallowing one  but they're even better for adults who need something to do with their hands during long, boring meetings.